The launch of the FIFA Women's World Cup, France France 2019™ took place on Tuesday morning in Paris. 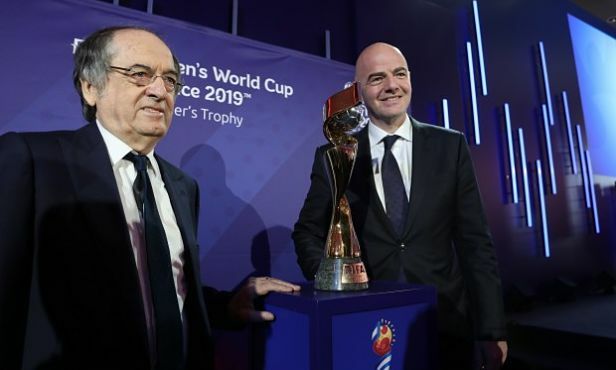 Gianni Infantino,FIFA President and Noël Le Graët, French Federation President, have officially launched the eighth FIFA Women's World Cup: France 2019, which will see the best women players on the planet gather in France from 7 June to 7 July 2019. Olympique Lyon's staidum has been chosen to host the two semi-finals on 2 and 3 July, then the final on 7 July. Olympique Lyonnais are very pleased to have being chosen as hosts, not least because it's confirmation of the renown of their stadium, and once again sees the club deemed worthy of hosting an international event and being given the honour of playing a part in the development of women's football, something it has already done for more than ten years. In Lyon this morning to attend business meetings, Jean-Michel Aulas expressed his pleasure at this announcement, "I'm very pleased that France is set to host the FIFA Women's World Cup, a competition to which I feel very attached and it's a huge honour for Olympique Lyonnais to be entrusted with organising the two semi-finals and the final. Women's football is going great guns in France; the 2019 World Cup will undoubtedly further its rise. We hope that his event will be fun and open to everyone and, to this end, we're working with the city sports association to organise a tournament during the World Cup that will foster a communal vibe that centres around women's football in the city of Lyon." "It's very important that a great footballing nation like France is able to host this World Cup. I hope it's the greatest in history, with an estimated audience of a over a billion televiewers. That'll be amazing, magical." "We'll put on a truly special event for the development of women's football, it's a privilege to be hosting this."